The Physicians’ Desk Reference is the nation’s most trusted source of FDA-approved prescribing information and is consulted by health care professionals millions of times each week. It is distributed to almost half a million MDs and chief pharmacists throughout the United States. Ninety percent of health care professionals consider this reference their most important source of reliable information and feel that it helps them in making the right decision when advising their patients which products they should use. 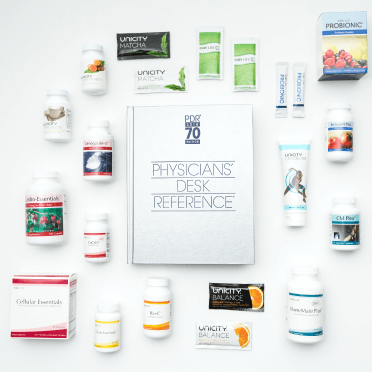 Our continued focus on clinical research has enabled Unicity to list Unicity Balance, along with ten other unique products, in this prestigious reference for health care professionals. Bio-C™ is a vitamin C nutritional supplement. Bio-C™ is a yellow, water-soluble, crystalline powder pressed into a tablet. Each Bio-C™ tablet consists of a proprietary blend of ascorbyl palmitate, calcium ascorbate, ascorbic acid, magnesium ascorbate, and 37.5 mg of citrus bioflavonoids. In addition to the active ingredients, each tablet contains cellulose, stearic acid, silicon dioxide, croscarmellose sodium, and magnesium stearate. Take one tablet morning and night with a meal. Bio-C™ is well tolerated. Some gastrointestinal discomfort may be experienced as with any dietary supplement. Carr, AC and Frei B. (1999), American Journal of Clinical Nutrition 96: 1086-1107. Jacob, RA and Sotoudeh G. (2002), Nutrition in Clinical Care 5: 66-74. Deruelle F, Baron B. (2008), Journal of Alternative and Complementary Medicine 14:1291-1298. Levine M, Rumsey SC, Daruwala R, Park JB, Wang Y. (1999), The Journal of the American Medical Association 281: 1415-1423. 1 THESE STATEMENTS HAVE NOT BEEN EVALUATED BY THE FOOD AND DRUG ADMINISTRATION. THIS PRODUCT IS NOT INTENDED TO DIAGNOSE, TREAT, CURE, OR PREVENT ANY DISEASE. Bios Life® C Plus is a fiber-based, vitamin rich dietary supplement. Bios Life® C Plus contains a blend of soluble and insoluble fibers, phytosterols, policosanol, an extract of Chrysanthemum morifolium, vitamins, and minerals that when combined with a healthy diet and exercise may lower total serum cholesterol and triglyceride levels. Bios Life® C Plus is light orange in color. It is a hygroscopic crystalline powder that is generally soluble in water. Each serving of Bios Life® C Plus contains 3 g of fiber, 1 g of phytosterols, 6 mg of policosanol, and 12.5 mg of an extract of Chrysamthemum morifolium. In addition to these active ingredients, each serving of Bios Life® C Plus contains maltodextrin, citric acid, orange juice powder, sucralose, and orange flavor. It’s estimated that Americans consume 10-12 g of total fiber per day, less than half the amount of the recommended daily intake. Epidemiological and clinical studies have correlated high daily fiber intake with an improvement in overall health. Bios Life® C Plus is a dietary supplement designed to increased daily fiber intake. Each serving of Bios Life® C Plus contains three grams of dietary fiber. When taken three times daily, Bios Life® C Plus contributes nearly half of the recommended daily value of fiber. Fiber supplementation has been shown to decrease preprandial and postprandial glucose levels and lower LDL cholesterol and apolipoprotein B levels. In addition to fiber supplementation, Bios Life® C Plus contains a patented blend of phytosterols, policosanol, Chrysanthemum morifolium, vitamins, and minerals. This blend of ingredients optimizes cholesterol levels through a combination of four mechanisms. First, the soluble fiber matrix prevents cholesterol reabsorption in the gastrointestinal tract through bile-acid sequestration. Second, the phytosterols reduce dietary absorption of cholesterol. Third, policosanol inhibits hepatic synthesis of cholesterol mediated through HMG-CoA reductase. Fourth, Chrysanthemum morifolium provides phytonutrients that enhance conversion of cholesterol to 7-α-hydryoxycholesterol. The four mechanisms provide a synergistic approach to optimizing cholesterol levels. Dissolve the contents of one packet or one scoop into 8 to 10 fl. oz. of liquid (water or juice) and stir vigorously. Drink immediately. Use 15-20 minutes prior to meals up to three times daily. Bios Life® C Plus is well tolerated. There may be mild gastrointestinal discomfort, such as increased flatulence or loose stools, during the first month of initial use due to the increased uptake of dietary fiber. This GI disturbance usually disappears within the first thirty days. If the GI discomfort persists, reduce the number of servings of Bios Life® C Plus. If the GI discomfort further persists, stop taking the product and consult your physician. Taking this product without adequate liquid can result in complications. Bios Life® C Plus is packaged in single-serving foil packets or in bulk canisters. Sprecher, DL and Pearce GL (2002), Metabolism 51: 1166–70. Verdegem, PJE; Freed, S and Joffe D (2005), American Diabetes Assocation 65th Scientific Sessions, San Diego, CA. Duenas, V; Duenas, J; Burke, E and Verdegem, PJE (2006), 7th International Conference on Arteriosclerosis, Thrombosis, and Vascular Biology, American Heart Association, Denver, CO. Verdegem, PJE (2007), Current Topics in Nutraceutical Research 5: 1-6 US Patent 6,933,291. * THESE STATEMENTS HAVE NOT BEEN EVALUATED BY THE FOOD AND DRUG ADMINISTRATION. THIS PRODUCT IS NOT INTENDED TO DIAGNOSE, TREAT, CURE, OR PREVENT ANY DISEASE. ProBionic® contains four strands of live, healthy bacteria that enter the digestive system and help balance bacterial populations in the intestinal tract. This supplement is for individuals with symptoms of poor digestive health such as constipation, diarrhea, bloating, and inflammation. ProBionic® is a water-soluble, light-pink crystalline powder. The proprietary encapsulation used for ProBionic® allows the healthy bacteria to be delivered to the small intestines alive, ensuring the bacteria can confer health benefits for the user. Each packet of ProBionic® contains a 100 mg Probiotic Blend of Lactobacillus acidophilus LA 02, Lactobacil- lus rhamnosus LR 04, Bifidobacterium breve BR 03, and Bi- fidobacterium lactis BS 01, with a total of 5 billion cells. In addition to these live bacteria, each 2 g packet also contains xylitol, natural berry flavor, citric acid, and silica. Your body needs good bacteria to help with detoxification, food digestion, waste removal, production of vitamins, and protection from harmful organisms. When the intestinal bacteria is imbalanced and unhealthy bacteria dominate, the body is less able to fight off infection resulting in inflam- mation. The individual strains used in ProBionic® are help- ful for maintaining overall gut health. The proprietary encapsulation used in ProBionic® allows healthy strains of bacteria to be delivered to the digestive system alive and undisturbed. This also ensures the bac- teria will remain alive throughout their shelf life. ProBionic® is generally well tolerated. As with any dietary supplement, some gastrointestinal discomfort may be expe- rienced. ProBionic® is packaged in single-serve foil packets. Saggioro A. Probiotics in the treatment of Irritable Bowel Syndrome. Journal of Clinical Gastroenterology, 2004; 38(8): S104-106. Del Piano M, Carmagnola S, Andorno S, Pagliarulo M, Tari R, Mogna L, Strozzi GP, Sforza F, Capurso L. Evaluation of the intestinal colonization by microencapsulated probiotic bacteria in comparison to the same uncoated strains. Under pubblication in supplement of the Journal of Clinical Gas- troenterology. Del Piano M, Carmagnola S, Anderloni A, Andorno S, Bal- lare M, Balzarini M, Montino F, Orsello M, Pagliarulo M, Stratori M, Tari R, Sforza F, Capurso L. The use of probiot- ics in healthy volunteers with evacuation disorders and hard stools. A double blind, randomized, placebo-controlled study. Under pubblication in a supplement of the Journal of Clinical Gastroenterology. Pregliasco F., Anselmi G., Fonte L., Giussani F., Schieppati S., Soletti L. A New Chance of Preventing Winter Diseases by the Administration of Symbiotic Formulations. Journal of Clinical Gastroenterology, 2008; 42(2): 224-233. Bios Life® Vision Essentials™ is a nutritional supplement for maintaining healthy eyes. Bios Life® Vision Essentials- ™contains the following active ingredients: vitamin C, vita- min E, zinc, natural beta carotene, lutein, zeaxanthin, and anthocyanidins from wild bilberry, wild blueberry, straw- berry, cranberry, grape seed extract, elderberry, and rasp- berries. Bios Life® Vision Essentials™ is a purple crystalline pow- der that is water-soluble. In addition to the active ingredi- ents, each capsule contains silicon dioxide, microcrystalline cellulose, and is packaged in vegetarian capsules. Antioxidants from the carotenoid chemical family, such as beta carotene, lutein, and zeaxanthin, play an important role in eye health. Clinical studies have demonstrated that lutein and zeaxanthin are concentrated to the retina and lens of the eye. Supplementation with high levels of lutein can restore the lutein concentration in the retina. Further supplementation of vitamins C, E, and A (in the form of beta-carotene) along with zinc and copper aid with the healthy function of the eyes. Additional support for the eyes comes from a proprietary berry blend included in Bios Life® Vision Essentials™. This proprietary berry blend contains anthocyanidins, antioxidant compounds that support the vasculature within the eye. Take two capsules per day with a meal. Bios Life® Vision Essentials™ is well tolerated. As with any dietary supplement, some gastrointestinal discomfort may be experienced. Krishnadev N, Meleth AD, Chew EY (2010) “Nutritional supplements for age-related macular degeneration.” Cur- rent Opinion in Opthamology 21:184-189. Ma L, Lin XM, Zou ZY, Xu XR, Li Y, Xu R. (2009) “A 12-week lutein supplementation improves visual function in Chinese people with long-term computer display light exposure.” British Journal of Nutrition 102: 186-190. Yagi, A, Fujimoto, K, Michihiro, K, Goh, B, Tsi, D, Nagai, H, (2009) “The effect of lutein supplementation on visual fa- tigue: A psychophysiological analysis”. Applied Ergonomics 40:1047-1054. Age Related Eye Disease Study Group, (2001) “A random- ized, placebo-controlled, clinical trial of high-dose supple- mentation with vitamins C and E, beta carotene, and zinc for age-related macular degeneration and vision loss: AREDS report no. 8”. Archives of Ophthalmology. 10: 1417-36. * THESE STATEMENTS HAVE NOT BEEN EVALUATED BY THE FOOD AND DRUG ADMINISTRATION. THIS PRODUCT IS NOT INTENDED TO DIAGNOSE, TREAT CURE, OR PREVENT ANY DISEASE. Cardio-Basics™ is a nutritional supplement that combines multivitamins, minerals, and antioxidants to support the cardiovascular system. Cardio-Basics™ is a light orange, water-soluble powder pressed into tablets. Each tablet of Cardio-Basics™ con- tains the following vitamins, minerals, amino acids, and an- tioxidants: beta-carotene (vitamin A), thiamine (vitamin B1), riboflavin (vitamin B2), niacin (vitamin B3), calcium d-pantothenate (vitamin B5), pyridoxine hydrochloride (vi- tamin B6), folate (vitamin B9), cyanocobalamin (vitamin B12), ascorbic acid and ascorbyl palmitate (vitamin C), cho- lecalciferol (vitamin D), d-alpha-tocopherol (vitamin E), bi- otin, calcium, chromium, copper, magnesium, manganese, molybdenum, phosphorus, potassium, selenium, sodium, zinc, L-arginine, L-carnitine, L-cysteine, L-lysine, L-proline, inositol, coenzyme Q10, and maritime pine extract. In addi- tion to those active ingredients, each tablet also contains cellulose, croscarmellose sodium, stearic acid, silicon diox- ide, and magnesium stearate. Take two tablets daily with food. Cardio-Basics™ is well tolerated. Contains chromium and niacin. Do not use if pregnant, nursing, diabetic, or when taking other niacin-containing supplements. Niedzwiekcki A, Rath, M. (1996) Journal of Applied Nutri- tion, 48: 67-78. Jeejeebhoy F, Keith M, Freeman M, Barr A, McCall M, Ku- rian R, Mazer D, Errett L, (2002), American Heart Journal 143: 1092-1100. Verdgem PJE, Lonky S, Curley S. (2005) 7th Conference on Arteriosclerosis, Thrombosis and Vascular Biology. Lloyd-Jones D, Adams R, Carnethon M, DeSimone G, Fer- guson TB, Flegal K, Ford E, Furie K, Go A, Greenlund K, Haase N, Hailpern S, Ho M, Howard V, Kissela B, Kittner S, Lackland D, Lisabeth L, Marelli A, McDermott M, Meigs J, Mozaffarian D, Nichol G, O’Donnell C, Roger V, Rosamond W, Sacco R, Sorlie P, Stafford R, Steinberger J, Hong Y; (2009) Circulation, 119: 480-486. Cardio-Essentials™ is a dietary supplement for the heart. Cardio-Essentials™ contains Coenzyme Q-10, L-carnitine, L-taurine, and Hawthorn berry. Cardio-Essentials™ is a light tan, water-soluble powder. Each serving of Cardio-Essentials™ contains 100 mg of Coenzyme Q-10 and 3.5 g of a blend of L-carnitine, L-taurine, and Hawthorn berry. In addition to these active ingredients, each capsule also contains silicon dioxide, stea- ric acid, and calcium silicate. The ventricles of the heart requires specific nutrients to maintain overall health. These important nutrients are in- cluded in Cardio-Essentials™: Coenzyme Q10, L-carnitine, and L-taurine. In a clinical study, the combination of L-carnitine, L-taurine, and Coenzyme Q10 was shown to re- duce the size of the left ventricle, which is important to maintain heart health. These ingredients are known to be important in providing adequate energy for heart muscle. Cardio-Essentials™ provides adequate amounts of these in- gredients, i.e. 100 mg of CoQ10. Hawthorn extract is tradi- tionally used in supporting the heart function. Take three capsules twice daily with food. Cardio-Essentials™ is well tolerated. As with any dietary supplement, some gastrointestinal discomfort may be expe- rienced. Lee, JH. et al. (2011) Congestive Heart Failure 4 199-203. * THESE STATEMENTS HAVE NOT BEEN EVALUATED BY THE FOOD AND DRUG ADMINISTRATION. THIS PRODUCT IS NOT INTENDED TO DIAGNOSE, TREAT, CURE, OR PREVENT ANY DISEASE. CM Plex® and CM Cream are a softgel and topical cream, respectively, that contain a proprietary blend of cetylated fatty acids, soy, and fish oil. CM Plex® is an opaque oil that is insoluble in water. One softgel capsule of CM Plex® contains 350 mg of cetylated fatty acids, 160 mg of soy oil, and 25 mg of salmon oil. In addition to these active ingredients, each softgel capsule contains glycerin and St. John’s Bread. CM Cream is an off-white cream that is insoluble in water. One gram of CM Cream contains 7.7 mg of cetylated fatty acids and olive oil. In addition to these active ingredients, CM Cream also contains glyceryl stearate, glycerin, leci- thin, tocopheryl acetate, benzyl alcohol, phenoxyethanol, carbomer, PEG-100 stearate, sodium hydroxide, methylpar- aben, propylparaben, butylparaben, ethylparaben, isobutyl- paraben,and citrus aurantium bergamia (Bergamot) fruit oil. Softgels: Take one to two softgels three times daily with meals. Cream: Apply generously onto clean skin and gently massage until the cream disappears. Repeat 3 to 4 times daily as necessary. For maximum results, use both products con- currently. CM Plex® Softgels and CM Cream are well tolerated. As with any dietary supplement, some gastrointestinal discom- fort may be experienced with CM Plex® Softgels. CM Plex® is available in softgels and as a topical cream. Hesslink, R et al (2002), Journal of Rheumatology 29, 1708– 1712. Kraemer, WJ et al (2004), Journal of Rheumatology 31, 767–774. Core Health is a patent-pending multivitamin designed to maintain overall health and wellness. This product consists of three tablets, namely a Day tablet, a Night tablet, and a Genome tablet. Core Health is the flagship product of Unicity International’s Genomeceutical™ line of products. The Day tablet is a dark yellow color. The active ingredients in the Day tablet are as follows: vitamin A, beta-carotene, vitamin C, vitamin E, vitamin B1, riboflavin, niacinamide, vitamin B6, folic acid, vitamin B12, biotin, vitamin B5, iron, zinc, CoQ10, phosphatidyl serine, green tea extract (stan- dardized to 38% EGCG), quercetin, turmeric extract (stan- dardized to 20% total curcuminoids), and sugar cane extract (standardized to 60% octacosanol). Other ingredients in the Day tablet are as follows: Silicified microcrystalline cellu- lose, acacia gum, sodium carboxymethyl starch, potato starch, stearic acid, coating (dextrin, dextrose, soy lecithin, sodium carboxymethylcellulose, sodium citrate), silicon di- oxide, and magnesium stearate. The Night tablet is a light greenish color. The active ingre- dients in the Night tablet are as follows: vitamin D3, cal- cium, magnesium, L-theanine, and lavender. Other ingredi- ents in the Night tablet are as follows: Acacia gum, potato starch, stearic acid, coating (dextrin, dextrose, soy lecithin, sodium carboxymethylcellulose, sodium citrate), silicon di- oxide, and magnesium stearate. boxymethylcellulose, sodium citrate), and magnesium stea- rate. Take 1 Day (D) packet (6 tablets—3 Day and 3 Genome) in the morning and 1 Night (N) packet (6 tablets—3 Night and 3 Genome) in the evening daily with water. Do not exceed recommended dosage. Core Health is generally well tolerated. As with any dietary supplement, some gastrointestinal discomfort may be expe- rienced. Available as tablets in single-serve foil packets. Palmer JD, Soule BP, Simone BA, Zaorsky NG, Jin J, Simone NL: MicroRNA Expression Altered by Diet: Can Food be Medicinal? Aging Res Rev 2014, 17: 16-24. Kato-Kataoka K, Sakai M, Ebina R, Nonaka C, Asano T, Miyamori T: Soybean-Derived Phosphatidylserine Improves Memory Function of the Elderly Japanese Subjects with Memory Complaints. J Clin Biochem Nutr 2010, 47: 246-255. Taylor TC, Rapport L, Lockwood GB: Octacosanol in Human Health. Nutrition 2003, 19: 192-195. Christakos S, Dhawan P, Porta A, Mady LJ, Seth T: Vitamin D and Intestinal Calcium Absorption. Mol Cell Endocrinol 2011, 347: 25-29. Kimura K, Ozeki M, Juneja LR, Ohara H: L-Theanine Re- duces Psychological and Physiological Stress Responses. Biol Psychol 2007, 74: 39-45. Hirokawa K, Nishimoto T: Effects of Lavender Aroma on Sleep Quality in Healthy Japanese Students. Percept Mot Skills 2012, 114: 111-122. In digestion, enzymes liberate and break down nutrients from food that become the building blocks for cell growth and regeneration. Proper enzyme levels are crucial to a healthy body. In order to provide a balanced blend of specific enzymes and help break down foods in digestion, Enzygen® Plus contains a wide variety of unique enzymes that aid in digestion. The enzymes found in Enzygen® Plus help break down various types of fats, carbohydrates, and proteins to help convert food into useful nutrients for the body. Addi- tionally, Enzygen® Plus helps to promote proper digestion and helps the stomach maintain proper acidity. The five basic categories of enzymes include lipase for breaking down oils and fats, cellulase to break down fibers, amylase for breaking down starches, lactase for dairy prod- ucts, and protease to break down proteins. There are many different enzymes in Unicity’s proprietary blend of enzymes found in Enzygen® Plus. These include different forms of amylase, protease, lipase, catalase, lac- tase, cellulase, hemicellulase, invertase, peptidase, brome- lain, papain, superoxide dismutase, beta-glucanase, and phytase. Our bodies need proper levels of active enzymes in order to conduct a variety of tasks, including digestion. While en- zymes occur naturally in our bodies and in plants, they can be destroyed by pesticides, pollution, processes used to cook or irradiate foods, and chemical additives. Enzygen® Plus supplements your enzyme supply to help your body break down fats, carbohydrates, and proteins, convert foods to useful nutrients, and complete proper digestion. Enzymes are natural substances created in plant, animal and human cells, and they play a vital role in digestion. There are more than 2,700 identified enzymes in the human body, and each affects a unique chemical reaction. The body relies on properly functioning enzymes to assist with breathing, digestion, growth, blood coagulation, sensory perception, reproduction, and other functions. Enzygen® Plus contains a wide variety of enzymes and other ingredients that may aid digestion by breaking down food in the digestive system, stimulating the release of es- sential nutrients from food. Take one capsule three times daily with food. Enzygen® Plus is generally well tolerated. As with any di- etary supplement, some gastrointestinal discomfort may be experienced. Roxas M. The Role of Enzyme Supplementation in Digestive Disorders. Alternative Medicine Review. 2008; 13(4): 307- 314. Shastri D, Kumar M, Kumar A. Modulation of lead toxicity by Spirulina fusiformis.Phytother Res 1999;13:258-60. Peirce A. The American Pharmaceutical Association Practi- cal Guide to Natural Medicines. New York, NY: William Morrow and Co., 1999. Immunizen® is a dietary supplement for strengthening and fortifying the immune system. Immunizen® is a modestly water-soluble, white crystalline powder. Immunizen® consists of a proprietary ingredient blend of colostrum, arabinogalactan, 1,3, 1,6 yeast beta- glucans, and lactoferrin. In addition to the active ingredi- ents, each 835 mg capsule of Immunizen® contains natural gelatin, stearic acid, and silicon dioxide. Immunizen® combines the positive immune modulating ef- fects of colostrum, arabinogalactans, yeast beta-glucans, and lactoferrin to boost your body’s natural defenses to for- eign antigens. Colostrum is composed of immunoglobulins that bolster the body’s immune system by providing immu- nity against various pathogens. Beta-glucans are generally derived from the cell walls of the yeast species Saccharomyces cerevisiae. Beta-glucans are potent immuno-modulating agents that prime both the in- nate and adaptive immune systems. As a dietary supplement, take two capsules daily with wa- ter one to two hours before a meal. Immunizen® is well tolerated. As with any dietary supple- ment, some gastrointestinal discomfort may be experienced. Lilius EM, Marnila P. (2001), Current Opinion in Infectious Diseases 14:295-300. Hammarström L, Weiner CK. (2008), Advances in Experi- mental Medicine and Biology 606: 321-343. Joint Mobility is a nutritional supplement for overall joint health. Joint Mobility contains Undenatured Type II Collagen, Tur- meric Extract (95% Curcumin), Boswellia Extract and Vitamin D3 as active ingredients, and also includes micro- crystalline cellulose and silicon dioxide. This supplement is for individuals with joint pain and discomfort caused from normal wear and tear. Joint Mobility is a powder filled capsule that takes on the yellow color of Turmeric. Compared to more traditional joint supplements, Joint Mobility is a small dose at just 881 mg per day. These smaller capsules are ideal for individuals who have trouble taking large capsules or pills. Many people suffer daily from joint pain and discomfort caused from years of overuse or from being overweight or obese. Joint pain and a loss of mobility can dramatically af- fect quality of life, making simple everyday activity difficult and painful. The ingredients contained in Joint Mobility work in several different ways to help maintain overall joint health. Curcumin and Boswellia extract have been shown to downregulate the genes involved in chronic inflammation. Vitamin D3 has been shown to help increase collagen pro- duction which is needed to maintain overall joint health. Joint Mobility works in several different ways for a multi- faceted approach to joint health. The ingredients contained have been shown to inhibit proinflammatory pathways, and also help to prevent the breakdown of joint collagen allow- ing the body to repair and heal itself. Joint Mobility is generally well tolerated. As with any di- etary supplement, some gastrointestinal discomfort may be experienced. Crowley DC, Lau FC, Sharma P, et al. : Safety and efficacy of undenatured type II collagen in the treatment of osteoar- thritis of the knee: a clinical trial. Int J Med Sci 2009, 6:312- 321. Chandran B, Goel A.: A randomized, pilot study to assess the efficacy and safety of curcumin in patients with active rheumatoid arthritis. Phytother Res. 2012 Nov; 26(11): 1719-25. Doi: 10.1002/ptr.4639.Epub 2012 Mar 9. Dobak J1, Grzybowski J, et al. : 1,25-Dihydroxyvitamin D3 increases collagen production in dermal fibroblasts. J Der- matol Sci. 1994 Aug;8(1):18-24. Kimmatkar N, Thawani V, et al. : Efficacy and tolerability of Boswellia serrate extract in treatment of osteoarthritis of knee—a randomized double bling placebo controlled trial. Phytomedicine 2003 Jan; 10(1):3-7. Reuter S, Gupta S, et al. : Epigenetic changes induced by curcumin and other natural compounds. Genes Nutr (2011) 6:93–108. Takada Y, Ichikawa H, et al. : Acetyl-11-Keto-β-Boswellic Acid Potentiates Apoptosis, Inhibits Invasion, and Abolishes Osteoclastogenesis by Suppressing NF-κΒ and NF- κΒ- Regulated Gene Expression. J Immunol 2006; 176:3127- 3140. OmegaLife-3™ is a blend of omega-3 fatty acids designed to help maintain healthy cardiovascular and cerebral function. OmegaLife-3™ is an amber-colored, semi-viscous, fat- soluble liquid. Each serving of OmegaLife-3™ contains the following active ingredients: 800 mg eicosapentaenoic acid (EPA), 400 mg docosahexaenoic acid (DHA), and vitamin E. In addition, it also contains the inactive ingredients gelatin, glycerin, purified water, and orange oil. OmegaLife-3™ has been molecularly distilled to ensure exceptionally pure oil and includes orange oil to prevent a fishy aftertaste. Clinical research suggests fish oil can help support proper brain and visual function. In 2002 the FDA approved sup- plementation of DHA in infant formula. DHA is potentially important in fetal and infant neural development, in that DHA and arachidonic acid have been shown to be incorpo- rated into brain and retinal cell membranes—particularly during the third trimester of pregnancy and early infant life. DHA is the predominant structural fatty acid in the central nervous system and in the retina of the eyes. EPA supports the synthesis of important compounds in the body. EPA is the precursor of thromboxane and leukotriene, compounds involved in supporting healthy circulation. They also promote healthy blood vessels. Take two softgels twice daily with a meal. OmegaLife-3™ is well tolerated. As with any dietary sup- plement, some gastrointestinal discomfort may be experi- enced. Common side effects include a “fishy” taste upon eructation. Lee JH, Harris WS, et al. Omega-3 fatty acids for cardiopro- tection. Mayo Clin Proc. 2008 Mar;83(3):324-32. SanGiovanni JP, Chew EY, Sperduto RD, et al. The relation- ship of dietary omega-3 long-chain polyunsaturated fatty acid intake with incident age-related macular degeneration: AREDS report no. 23. Arch Ophthalmol. 2008 Sep;126(9):1274-9. SanGiovanni JP, Parra-Cabrera S, Colditz GA, Berkey CS, Dwyer JT. Meta-analysis of dietary essential fatty acids and long-chain polyunsaturated fatty acids as they relate to vis- ual resolution acuity in healthy preterm infants. Pediatrics 2000;105:1292-8. Kris-Etherton PM, Harris WS, Appel LJ. Omega-3 fatty ac- ids and cardiovascular disease: new recommendations from the American Heart Association. Arterioscler Thromb Vasc Biol. 2003;23(2):151-152. 1 THESE STATEMENTS HAVE NOT BEEN EVALUATED BY THE FOOD AND DRUG ADMINISTRATION. THIS PRODUCT IS NOT INTENDED TO DIAGNOSE, TREAT, CURE, OR PREVENT ANY DISEASE. As we age, levels of CoQ10 in the body decrease, causing the degeneration of cells. This may contribute to age-related conditions. Ubiquinol CoQ10 provides essential nutrients that may benefit the heart; it also contains antioxidants that may combat free-radical damage as well as help to nat- urally sustain healthy levels of CoQ10 in people as they age. Ubiquinol CoQ10 is a high-potency formula of Ubiquinol along with sunflower oil, yellow beeswax, and sunflower lecithin to increase solubility and bioavailability. CoenzymeQ10 (CoQ10) is found naturally in the body and plays an essential role in the production of energy in all cells. Ubiquinol (CoQ10) is found naturally in the body and plays an essential role in the production of energy in all cells. The body requires a sufficient amount of CoQ10 in order to func- tion optimally. This product may help enhance the effective- ness of the immune system. Some research has shown that a CoQ10 deficiency may contribute to possible side effects in persons taking statin medications. CoQ10 may support heart health and may assist the body in energy production in cells. CoQ10 is also an antioxidant that may protect cells from free radicals. Take one softgel daily. Do not take while on blood thinning medication without consulting a doctor. Ubiquinol CoQ10 is generally well tolerated. As with any dietary supplement, some gastrointestinal discomfort may be experienced. Resenfeldt, Franklin, Francis Miller, Phillip Nagley, Anthony Hadj, Silvana Marasco, Deahne Quick, Freya Sheeran, Michelle Wowk, Salvatore Pepe. 2004. Response of the Senescent Heart to Stress: Clinical Therapeutic Strate- gies and Quest for Mitochondrial Predictors of Biological Age. Annals of the New York Academy of Sciences 1019 1THESE STATEMENTS HAVE NOT BEEN EVALUATED BY THE FOOD AND DRUG ADMINISTRATION. THIS PRODUCT IS NOT INTENDED TO DIAGNOSE, TREAT, CURE OR PREVENT ANY DISEASE. Unicity Balance™ (also known as Bios Life® Slim or Bios Life® S) is a fiber-based, vitamin-rich nutritional supple- ment. Unicity BalanceTM contains a blend of soluble and in- soluble fibers, Unicity® 7× technology, phytosterols, polico- sanol, an extract of Chrysanthemum morifolium, vitamins, and minerals that when combined with a healthy diet and exercise may lower total serum cholesterol, and help achieve and maintain a healthy body weight. Unicity Balance™ is light orange in color. It is a hygroscopic crystalline powder that is generally soluble in water. Each serving of Unicity Balance™ contains 4 g of fiber, 1 g of phy- tosterols, 750 mg of Unicity 7×, 6 mg of policosanol, and 12.5 mg of an extract of Chrysanthemum morifolium. In ad- dition to these active ingredients, each serving of Unicity Balance™ contains maltodextrin, citric acid, orange juice powder, sweeteners, and orange flavor. Unicity Balance™ is a nutritional supplement designed to increase fiber intake. Each serving of Unicity Balance™ contains four grams of fiber. When taken three times daily, Unicity Balance™ contributes half of the recommended daily value of fiber. Fiber supplementation has been shown to decrease preprandial and postprandial glucose levels, lower LDL cholesterol and apolipoprotein B levels, increase satiety, and facilitate weight loss. In addition to fiber supplementation, Unicity Balance™ contains a patented blend of phytosterols, policosanol, Chry- santhemum morifolium, vitamins, and minerals. Unicity Balance™ facilitates weight loss through five distinct mechanisms. First, the soluble fiber matrix promotes an in- crease in satiety. Second, Unicity BalanceTM improves cho- lesterol levels. Reduction in LDL content removes a potent inhibitor of lipolysis. Third, Unicity Balance™ improves blood glucose levels. Appropriate serum glucose levels help maintain many metabolic processes in the body. Reducing insulin levels permits fatty acid oxidation to occur. Fourth, Unicity Balance™ restores appropriate leptin signaling. Lastly, Unicity Balance™ reduces triglyceride levels allow- ing for leptin to cross the blood-brain barrier and affect its mechanism of action. Dissolve the contents of one packet or one scoop into 8 to 10 fl. oz. of liquid (water or juice) and stir vigorously. Drink immediately. Use 15-20 minutes before meals up to three times daily. Unicity Balance™ is well tolerated. There may be mild gas- trointestinal discomfort, such as increased flatulence or loose stools, during the first month of initial use due to the increased uptake of dietary fiber. This GI disturbance usu- ally disappears within the first thirty days. If the GI dis- comfort persists, reduce the number of servings of Unicity Balance™. If the GI discomfort further persists, stop taking the product and consult your physician. Taking this product without adequate liquid can result in complications. Unicity Balance™ is packaged in single-serving foil packets or in bulk canisters. Sprecher, DL and Pearce GL (2002), Metabolism 51: 1166-70. Verdegem, PJE; Freed, S and Joffe D (2005), American Di- abetes Assocation 65th Scientific Sessions, San Diego, CA. Slavin, JL, (2005) Nutrition 21: 411-418. Duenas, V; Duenas, J; Burke, E and Verdegem, PJE (2006), 7th International Conference on Arteriosclerosis, Thrombo- sis, and Vascular Biology, American Heart Association, Den- ver, CO.